Leap of Faith is now closed for the winter period. However, bookings are now open for February 2019 onward. For group, party, school and corporate bookings please call 0117 980 7175. Choose from our three exciting activities below, combine two or go for all three in our full adventure package! Discounts available for Wild Place Project members. BOOK NOW! Highly recommended if you like adrenaline! 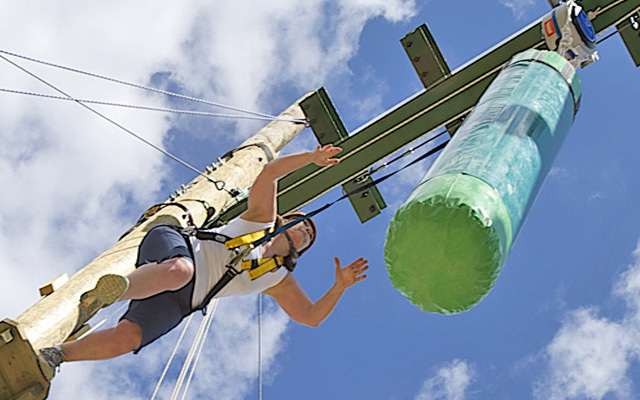 Satisfy your thirst for challenge and fun as you combine all three amazing part of our course; the climbing activities, the giant swing and the Leap of Faith jump. Approximately 1 hour, including safety talk and kitting up, to complete. Our namesake 'Leap of Faith' is the ultimate test of nerves! Get clipped in, climb the 25ft pole, take a deep breath and make 'The Leap' for the bag. Chose the distance of your leap depending on how brave you’re feeling! A favourite with both adults and children. Take on our exciting range of challenges, including the High Wire Ladder, the Gladiator Wall, the Totem Pole climb and a 25-ft Hang Tough challenge! Approximately 50 minutes. Buzzing with energy? Freefall 25-ft on Bristol’s only Giant Swing! This adrenaline rush is like no other. A unique experience not to be missed! Only fancy two of our activities? Pick and mix for just £10! or call 0117 980 7175 for more information. Leap of Faith tickets do not include general admission to Wild Place Project, but you have the option to add these tickets to your basket at checkout if you want to.